If you can’t beat ‘em, well then, just review ‘em ag’in. 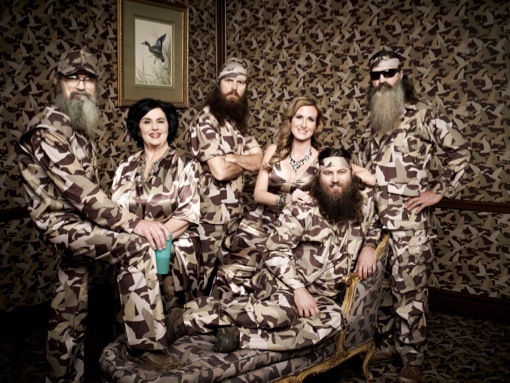 A lot has happened to the Robertsons of Monroe, Louisiana since Duck Dynasty premiered back in March of 2012. For one, they’ve become far richer international celebrities with an array of action figures, t shirts, caps, board games, books, etc. on sale. Even a Christmas CD -- no joke -- is comin’ ‘round the bend. Squirrel meat roastin’ on an open fire. Moonshine drippin’ on our beards. Duck Dynasty also all adds up to A&E’s biggest ratings-getter ever. The April 24th Season 3 finale, in which the Robertsons all went to Hawaii, drew 9.6 million viewers, with 5.5 million of them in the advertiser-prized 18-to-49-year-old motherlode. And all 13 episodes averaged 8.4 million viewers, with 4.8 million in the 18-to-49 demographic. The special one-hour Season 4 launch (Wednesday, Aug. 14th at 9 p.m. central) might well do even better than last season’s send-off. Filmed while the Robertson family negotiated a new deal with A&E (for a reported $200,000 per episode), it’s an obviously orchestrated but nonetheless coarsely charming run-up to a surprise wedding ceremony for patriarchs Phil and “Miss Kay” Robertson. Married 48 years ago by a justice of the peace, the Robertson elders have never had a “proper” nuptial. So the younger women of the clan -- Korie, Jessica and Missy -- naturally step in and plan a big ceremony while their menfolk whine and drag their feet. It all pretty much comes out in the wash, even if the males still tend to brag about their B.O. and infrequent shower-taking. I was dismissive of Duck Dynasty its first time around. But as concocted backwoods “reality” shows go, it’s stepped to the head of the class and far surpassed the likes of TLC’s Here Comes Honey Boo Boo and Buck Wild, which MTV canceled after its principal star, Shain “Gandy Candy” Gandee, died while racing around in a sport utility vehicle with his uncle and a friend, who also died. They reportedly were last seen leaving a West Virginia bar at 3 a.m. The bearded laddies of Duck Dynasty don’t mind poppin’ some cold ones. But the emphasis is mostly on stone cold sober misadventures, with Phil’s rather dim brother, Si, regularly leading the charge. In Wednesday’s return, subtitled “Till Duck Do Us Part,” Si is assigned to be “the distraction.” His job is to get Phil and Kay out of the house on their anniversary day so the rest of the Robertsons can throw together a backyard wedding chapel. Si decides to promise them an ice cream party at an undisclosed destination. Phil, who has become expert at making dry asides to the camera, equates this to “almost the beginning stages of dementia.” But he and his more excited wife of course play along, and likely were in on this whole deal all along. The threesomes’ meandering trip down Si’s convoluted “Memory Lane” ends up providing more comedy gold than the hasty goings-on back at the homestead. Korie’s husband, Willie, CEO of the Robertsons’ long prosperous Duck Commander company, leads the bitching and moaning after earlier being informed that he’s reached the point of being “whipped” by his wife. The episode could do without the repeated whipping sounds from a dim-witted employee named Godwin. But another of the show’s simpletons, known only as “Mountain Man,” turns out to be an amusing supporting character down the stretch. “He’s the slowest worker in all of West Monroe,” says Willie. Talks slow, too. Duck Dynasty’s comedy stylings, with Si the “logic vacuum,” lead to an affecting denouement that left even this hardened reviewer in an oddly choked-up state. All of the Robertsons now know how to play their parts. Just act naturally in accordance with story lines suggested by the show’s producers. I’ve now reached the point where I actually might buy a talking Uncle Si bobble head. It comes complete with a missing lower tooth. And if there’s ever an official Uncle Barky version, it’ll of course have a few screws loose.